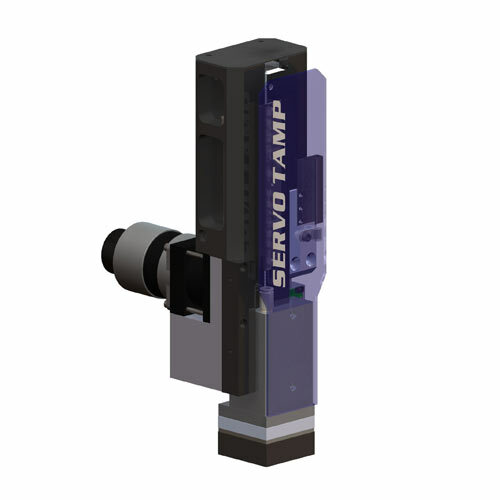 The ServoTamp is a high-speed tamp actuator that incorporates two axes of servo motion. One axis provides high-speed vertical motion and the other high-speed horizontal motion. The combination of these two axes allow any PL series applicator to run at higher rates due to parallel processing of certain operations that occur sequentially in pneumatic tamp units. This unit can be used to replace the standard pneumatic Tamp actuator for any PL series Applicator. The ServoTamp provides several benefits including very high speed motion with programmable acceleration/deceleration profiles that allow the Tamp to move at high rates when possible while still capable of performing precision placement operations to delicate devices or substrates. The ServoTamp option is currently only available for JAZZ Cell Systems.